What Can the US Do About Afghanistan's Run-Off Election Crisis? As the United States tries to resolve Afghanistan’s political crisis, it should keep a few things in mind. U.S. Secretary of State John Kerry arrived in Kabul late last night to try and patch up Afghanistan’s post-run-off election crisis. Abdullah Abdullah has alleged that the run-off vote was marred by widespread fraud by supporters of his opponent, Ashraf Ghani. While the country has not devolved into violence over the election, protests have occurred and emotions are starting to run hot. Both candidates are backed by powerful warlords in geographically distinct areas of the country and should the impasse persist, it is likely that civil war — or something very much like it — could break out along ethnic and partisan lines in Afghanistan. Kerry’s diplomacy in Kabul at this crucial juncture in Afghanistan’s political transition will be important in ensuring that the country’s nascent democracy endures this crisis. It is easy to forget that despite Ghani and Abdullah being the two most-discussed names in Afghanistan at the moment, Hamid Karzai remains in power and wields considerable influence in Afghan politics. Any resolution to this crisis will likely have to have Karzai’s blessing if it is to succeed and convince Afghans across the board that their democracy was not suddenly usurped by American intervention. Getting Karzai on board means that the resolution process must remain distinctly Afghan and free of foreign interference. Karzai has been clear about preserving the independence of Afghan politics, even through this crisis. The threat of losing critical U.S. aid does loom large over Afghanistan at this juncture but Kerry must not be seen as using this as leverage, either over Karzai or over either candidate. Karzai, fortunately, seems to have agreed to limited U.N. intervention. He supports a U.N. plan to audit 3.5 million ballots for fraud. Ghani’s camp is also on board with this plan; Abdullah remains recalcitrant. An unfortunate feature of keeping Karzai content is that the Abdullah camp perceives Karzai as supporting Ghani, making any proposal supported by Karzai automatically less likely to gain Abdullah’s acquiescence. This is perhaps obvious to the United States, but it is worrying that reports indicate Kerry has suggested to both candidates that the “loser” of the run-off be granted a new position, roughly comparable to that of a prime minister. Doing so would undermine Afghanistan’s constitution and government institutions, even if it would bring a short-term resolution to the crisis. If any such power-sharing agreement is even feasible (and it appears that it isn’t at the moment), it should be developed in conjunction with Afghanistan’s existing democratic apparatus. Should both candidates agree to a power-sharing agreement, Afghanistan should at the least run a referendum by the Wolesi and Loya Jirgas to add a modicum of democratic legitimacy to the arrangement. Any unilateral suggestion by the United States will be seen as unacceptable interference. The U.N. proposal mentioned above seems to be, if not the best, the least-worst option for resolving this crisis in Afghanistan. Abdullah remains skeptical of the initiative, maintaining that he will not accept any audit that places the turnout at over 5.5 million voters (the Independent Election Commission placed the turnout at 7 million — that’s a million more than the April 5 election). Kerry should focus on bringing Abdullah’s camp on board with this proposal with an assurance that he would accept the result of the U.N. audit, be it in his favor or in Ghani’s. There is additionally criticism from Ghani’s supporters that Abdullah has been inconsistent about his demands and has been changing his criteria for resolving the crisis. 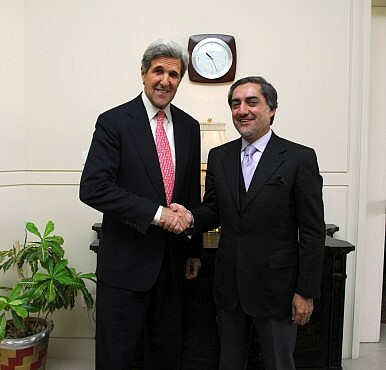 Kerry ought to gain a static list of demands from Abdullah’s camp. The United States might not have expected the results of the run-off election to cause a political crisis, particularly after the April 5 elections left everyone with an air of optimism about the trajectory of Afghanistan’s democracy. Similarly, there is no guarantee that Kerry will succeed, particularly in the short-term. Time is of essence to the United States as it prepares to pull its troops out of Afghanistan at the end of this year. The White House has been particularly keen for a new Afghan president so it can finally wrap-up negotiations for the Bilateral Security Agreement (BSA) that will allow Washington to leave behind a small contingency of troops for training and limited counter-terrorism operations. Both Ghani and Abdullah are in favor this agreement, but if neither one of them is in power by the end of August, the BSA simply might not be logistically feasible. The United States might not get the outcome it wanted in Afghanistan, and attempting to resolve the crisis with the BSA in mind might lead to more instability in the short-term, particularly if the current political crisis is not resolved in a way acceptable to all parties.